Following the 2010 House “shellacking” by the GOP, Democrats are hungry for revenge while Republicans are hungry for more. While there is an endlessly long list of unknowns as we assess the November 2012 races from our current vantage point, 22 months removed from Election Day, there are also several signposts that offer some suggestion of what the 2012 House elections may bring. While the midterm meltdown by Democrats was undoubtedly a severe setback—leaving them in need of a 25-seat gain to capture the House majority—it set them on firmer footing heading into 2012. Simply put, it will be very difficult for Republicans to find new Democratic seats to contest since their 2010 gains grabbed most of the districts they could easily flip. Conversely, Democrats now find themselves in the same position as the GOP was in two years ago, with a short list of districts to defend and a long list of potential targets. Republicans are at a high watermark in House seats—their current caucus of 242 members is their largest since 1949—and many of those new congressmen hail from districts where Democrats can wage a competitive contest. The key difference between 2010 and 2012 is obvious: 2012 will be a presidential, not a midterm, election year. Although that fact may seem self-evident, it offers a litany of historical comparisons that can offer early clues as to what 2012 has in store at the House level. Over the past half-century, presidents who were reelected swept in on their coattails an average of 10 new House members of their same party. In fact, all four of the presidents who sought and won reelection since 1960 (Richard Nixon in 1972, Ronald Reagan in 1984, Bill Clinton in 1996, and George W. Bush in 2004) also picked up seats in the House. These gains ranged from 15 new House seats for Republicans in 1984 to just 3 new seats for the GOP in 2004. 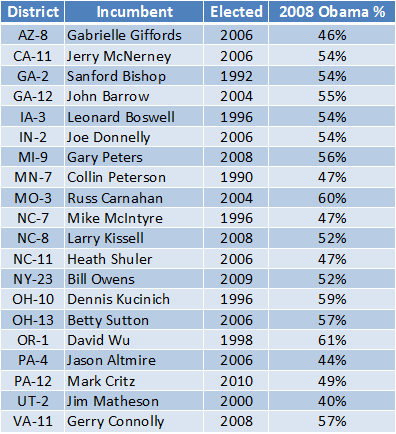 If Obama wins reelection next November, history therefore suggests his party will gain a handful of House seats. There are fewer historical precedents in recent years for defeated presidents, with only Jimmy Carter’s defeat in 1980 and George H. W. Bush’s 1992 loss as potential analogies to a 2012 Obama ouster. While Carter’s loss was accompanied by Democrats surrendering 33 seats in the House, Republicans actually picked up 10 new House seats even as Bush was defeated at the top of their ticket. Of course, Democrats will surely argue that history is made to be broken. With Republicans at such a high number of House seats, perhaps they are in line for a history-making regression to the mean along the same lines of the one they Democrats experienced last year. Perhaps Obama will once again rack up a large popular vote margin that will increase the length of his coattails, and Democrats will win seats in many of the 63 districts he carried in 2008 that are now represented by Republican congressmen. Perhaps, perhaps, perhaps. There are so many daunting unknowns—and unknowables—about the 2012 House picture from where we sit today, that we fully admit we are guessing. Not only are the candidates unknown—a perennial problem for prognosticators at this time of the cycle, as many incumbents have yet to announce their future plans and few challengers have announced their bids—but even the districts have yet to be drawn. While the decennial process of redistricting further unsettles the picture in the 43 states with multiple congressional districts, it clearly offers some advantages for Republicans. First, reapportionment, where the House’s 435 seats are redistributed according to the new Census populations for each state, has benefitted the GOP as the states gaining new districts (Arizona, Florida, Georgia, Nevada, Texas, Utah, Washington, and South Carolina) are mostly Republican. Just as fortuitously for Republicans, the states surrendering seats (New York, Ohio, Iowa, Illinois, Missouri, Michigan, Pennsylvania, Louisiana, New Jersey, and Massachusetts) are primarily Democratic. Not only will reapportionment likely boost Republican fortunes, but redistricting will add to that advantage. While reapportionment distributes congressional districts among the states, redistricting is a state-level process by which the state’s allotted districts are redrawn to account for population changes within the state, assuring that each district contains roughly the same number of people. With a few exceptions, such as Iowa’s nonpartisan redistricting bureau, redistricting is done by the state legislature and subject to the approval of the governor, via a process similar to any other legislative bill in many states. After picking up 720 state legislative seats and seven governorships in 2012, Republicans now control both houses of the state legislature plus the governorship in enough states to draw at least 159 House districts unimpeded by a Democratic chamber or chief executive. Democrats, for their part, will have complete control of the redistricting process for fewer than 50 districts, a sizable 3-to-1 disadvantage. Setting aside the stumbling blocks of redistricting and candidate announcements, it is still possible to put together a list of the most vulnerable incumbents, both Democrats and Republicans. Note that these congressmen and women have made this list for different reasons. Some, like Democrat Jason Altmire in PA-4 and Republican Robert Dold in IL-10, represent districts that will be difficult for anyone from their party to hold, especially if 2012 goes in the direction of their opponent’s party. Others, like Republican David Rivera of FL-25 and Democrat David Wu from OR-1, have earned their spot on the list due to their own actions and scandals which have garnered unwanted attention from the media and their constituents. Several, such as Democrats Leonard Boswell (IA-3) and Russ Carnahan (MO-3), face challenges stemming from redistricting which could turn a friendly district into a less favorable one. There is no obvious disparity in the number of potentially vulnerable incumbents for each party, as both Democrats and Republicans have members with tough reelection efforts ahead. As this list expands—as it no doubt will as each side starts recruiting candidates and capitalizing on newly-drawn districts—more members of both party will certainly be added. Now that they are out of the majority, some Democratic members may choose to retire rather than seek reelection, adding open seats that must be defended to this list of endangered incumbents. 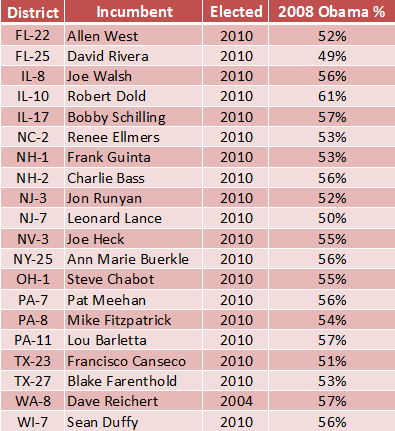 On the other hand, the GOP has an astounding 61 members who currently represent districts won by Obama in 2008. If redistricting does not shore up those Republicans, and Democrats can recruit credible challengers against them, more so-called “Obama Republicans” could become vulnerable in the coming two years. It is already clear from the above chart why Republicans could have a tough time defending their new majority if President Obama is roaring into a second term. All but one of their vulnerable incumbents is a freshman member of Congress, although three (Charlie Bass in NH-2, Mike Fitzpatrick in PA-8, and Steve Chabot in OH-1) served prior terms in office before being defeated in either 2006 or 2008. The fact that so many freshmen represent territory that is usually Democratic at the presidential level is cause for GOP concern. One final wild card will be the number of Democrats seeking comebacks from 2010 losses. Former congressmen have special advantages in that they once won and have an expansive fundraising base. Democrats’ greatest vulnerability, on the other hand, lies with the remnants of their landslide classes of 2006 and 2008. They also have a few more senior members who could become endangered if 2012 goes the way of 2010 and Democrats are put on the defensive. Kentucky’s Ben Chandler, Arkansas’ Mike Ross, and Oklahoma’s Dan Boren did not make this first cut of vulnerable incumbents as they are used to fending off challenges from deep behind enemy lines, but they all represent districts that gave Obama between 35% and 45% of the vote. If Obama stumbles in his reelection bid and Republicans come up with strong congressional recruits, then those three could become vulnerable veterans. Both Republicans and Democrats have their work cut out for them as the new House election cycle dawns. The GOP must find a way to shore up its historically large (and therefore potentially unstable) caucus, while Democrats look to beat the historical odds with a goal of capturing 25 House seats and regaining the majority once more.